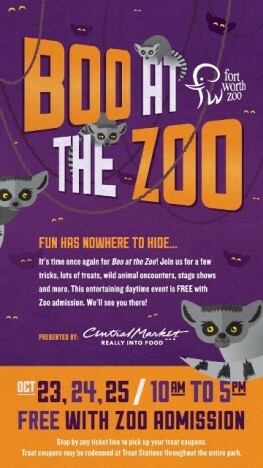 The Fort Worth Zoo’s Boo at the Zoo is a Halloween event that the whole family will enjoy. You and your family will see a few tricks and lots of treats, along with wild animals, stage shows and so much more. Dress up in your most spooktacular costume and experience the Halloween-themed activities and entertainment located throughout the Zoo. Treat coupons may be redeemed at Treat Stations throughout the entire park. You will receive 6 F REE Boo at the Zoo treat coupons with each paid admission at the Zoo’s ticket booths at no additional cost. Additional treat coupons may be purchased at the ticket booth for $3 per six coupons. Trick-or-treat at any of the 20 Treat Stations located throughout the Zoo. Treat Stations require a treat coupon. One coupon = 4 pieces of pre-mixed candy.